Secrets of The Beatles' visit to India to be explores at new exhibition . Beatles Radio: The Beatles, Solos, Covers, Birthdays, News The Fab 4 and More! The 50th anniversary of the world-famous Beatles travelling to Rishikesh in India is to be marked with a new exhibition in their home city of Liverpool. 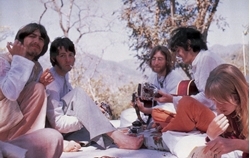 The exhibition, Beatles in India, at the award-winning Beatles Story museum will open on Feb. 16 and run for two years. It will look at what was a key and relatively secretive part of the lives of the four-strong band, John Lennon, Paul McCartney, George Harrison and Ringo Starr. It will feature never-before-seen memorabilia, imagery and personal accounts from the people who were there with the band in 1968. A sitar used by Ravi Shankar will go onto display within the new immersive area, loaned to The Beatles Story by the Ravi Shankar Foundation. As George Harrison's mentor, Shankar's influence on the him ultimately helped to popularise the use of Indian instruments in 1960s pop music.